MMR coverage ranged from a high of >99.9% in Mississippi (which does not allow any non-medical exemptions, good for them) to a low of 85.7% in Colorado. Note that Colorado might have artificially low reported rates because they only do a survey of about 0.5% of the population, while most other reporting jurisdictions providing data on 100% of their children. DTaP coverage ranged from a high of >99.9% in Mississippi (once again, blocking lame exemptions work) to a low of 82.9% in Arkansas and Colorado (again). Finally, two doses of varicella coverage ranged from, yes, you guessed it, >99.9% in Mississippi to a low of 84.6% in, yes, you also guessed this one, Colorado. The national non-medical median exemption rate was around 1.5%, slightly lower than 2011-12. The states with less than 1% non-medical vaccine exemptions in 2012-13 were Alabama, Delaware, District of Columbia, Indiana, Kansas, Kentucky, Louisiana, Maryland, Mississippi (of course), New Mexico, New York, North Carolina, Rhode Island and Virginia. The states with the highest non-medical exemption rates were Oregon at 6.4%, Vermont at 5.7%, Idaho at 5.5%, and Michigan at 5.3%. It’s interesting that Colorado, despite having the lowest vaccination coverage rates, only had a moderate non-medical exemption rate of about 4.0%, which may mean that Colorado lacks the institutional resources to police its vaccination policies. Finally, as stated by the CDC, there is evidence that getting an exemption does not necessarily lead to a child missing some or all of their immunizations. © Centers for Disease Control and Prevention, 2013. 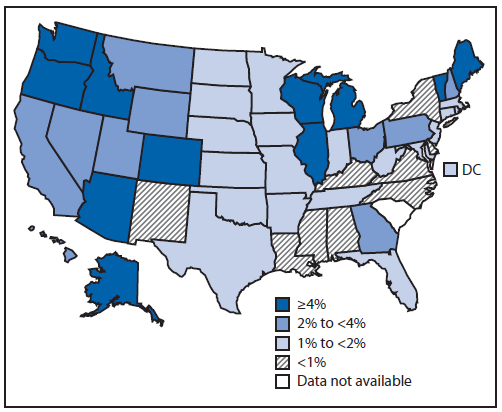 Vaccine coverage by state. Even though some states have fairly low exemption, like California which has a fairly low non-medical exemption rate of 2.8%, within the state, there are geographic clusters of children who are not being vaccinated and where vaccine exemption rates may be far above the average. A recent outbreak of whooping cough in California happened in an area with historically low immunization coverage. However, California, Oregon, and Washington, among many states, have passed legislation to make it somewhat more difficult to get a non-medical exemption. The target rate of 95% vaccine coverage (which gives a strong herd effect) was exceeded by DTaP coverage. 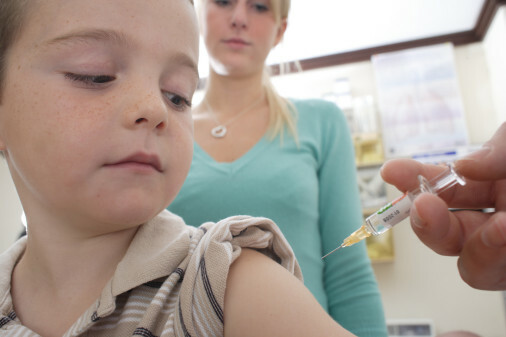 MMR and varicella vaccine coverage just slightly missed the target. Although, as mentioned above, low rates of vaccine coverage seem to cluster in a few areas, broadly speaking the anti-vaccination movement has made little headway to win “hearts and minds” of the vast majority of parents. Second, the exemption rate has flattened, or even dropped in many states. And as some states, such as Oregon, Washington and California, which have been hit hard by the whooping cough epidemic, laws were passed to make getting those exemptions more difficult. Third, and probably most important, the vaccination rate is not smoothly distributed across the country–some states exceed the target 95% level on all vaccinations, but some do not. Some, like Colorado and Idaho, have somewhat low vaccination rates (in the mid-80’s). Even in states with good vaccination rates, there are areas with high exemptions and low vaccination rates. Very simply, Vaccines Save Lives. I guess the vast majority of Americans agree, and kids are being vaccinated.